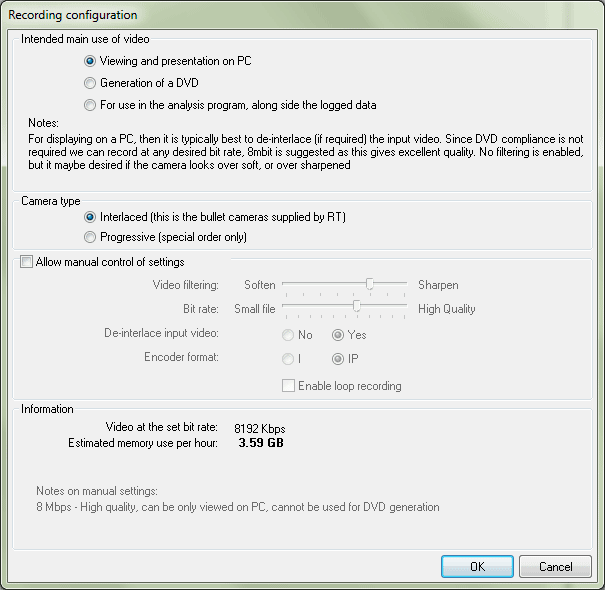 To open this window click on the Configuration -> Recording configuration menu item. Recording configurations window allows you to configure the settings related to the recording quality of the VIDEO4 system. Following sections on this page describe settings related to the recording quality. 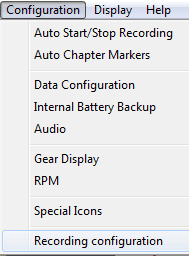 Note: that this section is enabled only if the “Allow manual control of settings” option is un-ticked. This option should be used if the video is intended to play on a PC. This option allows you to record the video at any desired bit rate. However the video may not compatible for DVD generation. Video will be recorded at 5Mbit to ensure the maximum compatibility with most DVD players. VIDEO4 will not de-interlace the input video as the television normally does a good job of de-interlacing for us. When you need to use the video with data analysis, speed and file size are more important than ultimate quality. When this option is selected, video will be de-interlaced (if necessary), soften it a little and recorded at 4Mbit. There are two options: progressive or Interlaced scanning camera. Note that bullet cameras supplied by the Race Technology are Interlaced type. If you tick the check box in the upper left corner on this section first two sections will be disabled. This allows you to manually configure the bit rate, de-interlacing settings for the input video and the encoder format. This is the maximum possible number of bits that can be written to disk per second while recording. When the bit-rate is low, the video file is smaller, but the quality is reduced. If the bit-rate is high, the videos file get larger but the quality is improved. It is required to decide the bit-rate depending on the speed of the disk, disk size, required quality and time needs to record. VIDEO4 is capable to handle Bit-rates from 2 Mbps to 12 Mbps. Bit-rate is required to set in the overlay file. 2Mbps is fine for when the video is required for quick track side analysis with the data and used within the analysis software. In this case load time of the video is more important than overall quality. When recording at this bit rate there are obvious "compression artifacts" around text, just as you get with a very compressed JPEG image. 4Mbps is considered the "normal" for video/data analysis with improved quality compared with 2Mbps. This setting is also adequate for generating DVD and subsequent playback on television. 6Mbps is consider the "normal" if the intention is to generate DVDs for playback on television. The DVD standard states that all players should support 6Mbps, although in practice most will support higher bit rates. 8Mbps can be used to generate very high quality DVDs although at this bitrate 100% compatibility cannot be garanteed. 9Mbps-12Mbps can be used to generate the highest quality video footage, however it is not recommended to generate DVDs at such high bitrates unless you previously tested you DVD player at these rates. The default option is Yes. Turning off de-interlacing gives an improved picture, only for video footages with very limited movement. IP - stands for Predictive frame. These frames are about half size of I frame and take longer to display as we need to decode from the preceeding I frame and work forwards. With option one, the VIDEO4 will only record video with Intra frames. This will result in reduced video quality compared to using P and B frames, but it will be faster in operation when using the analysis software. With option two the VIDEO4 use a mixture of I and P frames (In the sequence of I PPPPPP I ….). The videos that are recorded with this setting will have good compression quality, and quite fast in operation.